It was a day when the weather was so wretched that most of the elite runners walked off the course rather than finish what they’d started. A day that rewarded persistence and penalized boldness and that in the end produced historic champions. 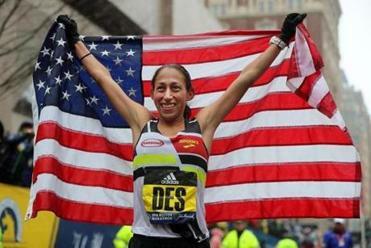 On a bitter, rainy, and windy Patriots Day, Desiree Linden became the first American woman in 33 years to win the Boston Marathon and Japan’s Yuki Kawauchi came from behind in the final mile to run down Kenya’s Geoffrey Kirui, the defending men’s titlist and reigning world champion. 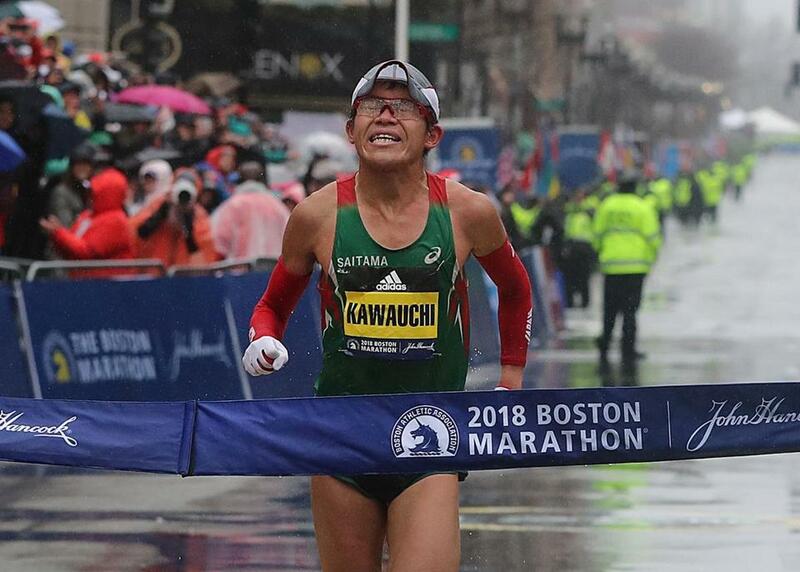 Kawauchi, the first Japanese winner here since Toshihiko Seko in 1987, came from more than a minute behind to catch the flagging Kirui at Kenmore Square and went on to win by nearly 2½ minutes. 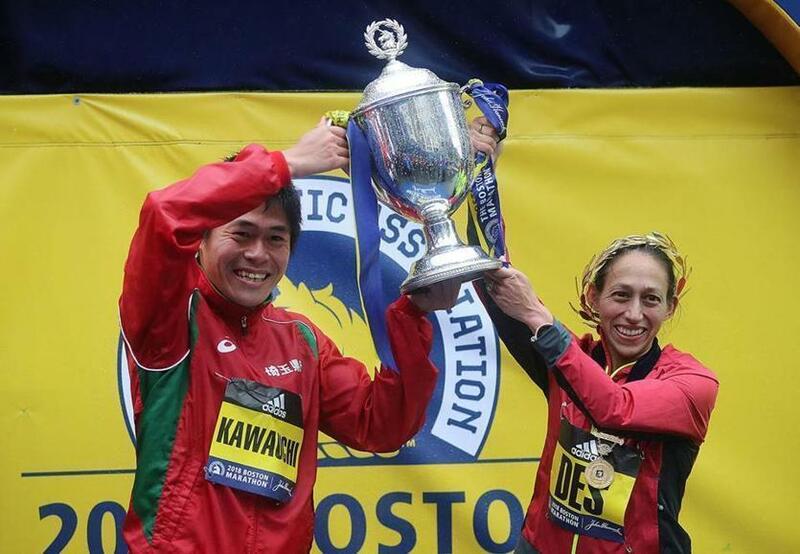 Yuki Kawauchi and Desiree Linden are the 2018 champions of Boston. A slow, steady pace allowed the women’s winner to execute her race plan tactically and effectively. 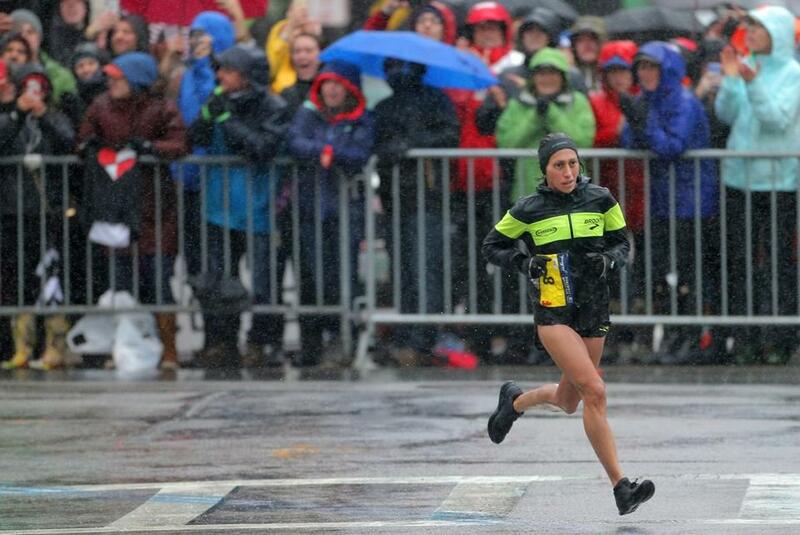 By the time Kawauchi crossed the finish line in Copley Square, virtually all of the top contenders — including Ethiopian former champions Lelisa Desisa and Lemi Berhanu Hayle and US star Galen Rupp — had dropped out rather than continue to fight a nasty, soaking headwind and a windchill around the freezing mark. The winning times, predictably, were the worst in decades. Kawauchi’s clocking of 2 hours 15 minutes and 58 seconds was the slowest since 1976, when Jack Fultz won the “Run for the Hoses” in 2:20:19 in near 100-degree heat. And not since Gayle Barron’s 2:44:52 in 1978 had a women’s winner posted a time beyond Linden’s 2:39:54. A pack of elite men splashes through Needham on a miserable weather day. Linden was feeling so miserable after six miles that she nudged countrywoman Shalane Flanagan (a distant seventh in 2:46:31) and told her that she might drop out. “I thought, ‘No way, not my day,’ ” said Linden. But she hung in, even waiting for Flanagan during her brief bathroom break about 11 miles in and later helping fellow US competitor Molly Huddle stay with the pack. Halfway through, Linden was back with the lead group. Coming down out of Wellesley, Linden found herself in third alongside defending champion Edna Kiplagat and Huddle. “I probably shouldn’t drop out,” she concluded. Victory, though, seemed unlikely. Up ahead, Ethiopia’s Mamitu Daska was all by herself, nearly half a minute in the lead heading into the Newton hills. If Linden pushed herself harder, she feared that she might blow up. Instead it was Daska, who’d borne the brunt of the elements, who faded going up Heartbreak. “When I made the right onto Hereford, I thought, ‘This is happening. This is for real,’ ’’ she said. Linden turns onto Hereford Street, about to cruise home to victory. The Americans, many of whom train in bone-chilling weather during the winter, turned nightmare conditions into dream finishes. “I’m shocked,” said Sarah Sellers, a 26-year-old nurse anesthetist who collected $75,000 for her runner-up placement. Seven US women finished in the top 10, as did six men. Kawauchi breaks the tape in Copley Square. Kawauchi, who’d dashed away from his rivals from the start in what appeared to be a rash move, was swallowed up by the pack but caught up with the leaders near the midpoint. Still, his chances seemed remote of catching Kirui, who went into the hills alone and led by more than a minute and a half at Heartbreak. But Kirui began running out of gas after Cleveland Circle. And Kawauchi, the iron man of the roads who ran 12 marathons last year and won five, kept grinding away. Kirui, who was hoping to become the first men’s champion to repeat since countryman Robert Kipkoech Cheruiyot won his fourth title in 2008, knew he was cooked when his legs stiffened with a mile to go. 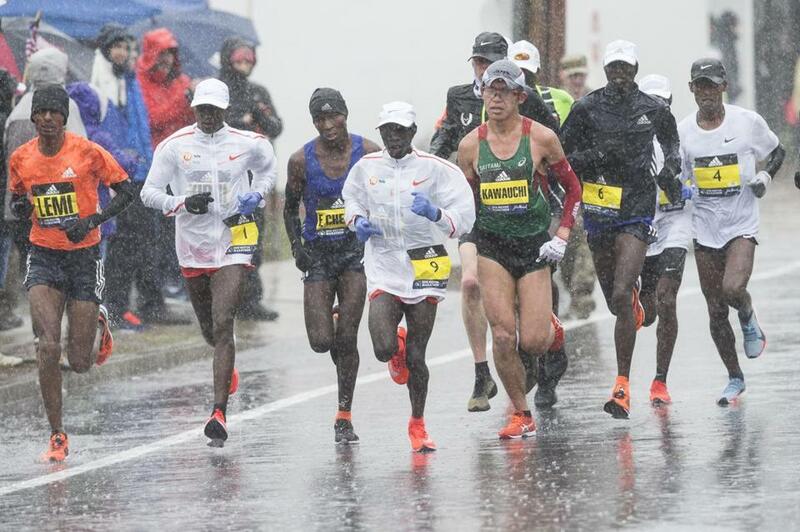 Kawauchi, who’d won the Marshfield Road Runners Marathon in sub-zero weather on New Year’s Day, was singing in the rain. “For me, these are the best conditions possible,” he said. One man’s downpour is another man’s delight.